Your Pittsburgh Penguins head out west for a three game run starting tonight with the Anaheim (Mighty) Ducks. 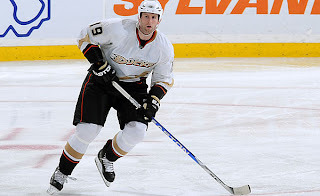 Former Penguin defenseman Ryan Whitney will be a big storyline going into tonight's game as it is the first time he has matched up against the his former team. Ryan currently is third in the NHL in ice time averaging 26:43 so expect to see a ton of him tonight. The Ducks have a huge first scoring line in Corry Parry, Ryan Getzlaf and Bobby Ryan. Parry leads the team in goals and total points while Getzlaf leads the team in assists. So you would think that Ryan is the weak point in the first line, he leads the team in shots. The Penguins will try to keep Marc-Andre Fleury's hot start this season during this west coast run. The rest of the NHL is starting to realize how MAF is playing. A recent poll on TSN is Canada shows Canadians want Fleury to start for the upcoming Olympic teams. Fleury was voted with 41% of the vote over Devils goaltender Martin Brodeur (27%) and Roberto Luongo (23%). Here is the projected lines from pittsburghpenguins.com. In a public service message to all Pittsburgh Penguins fans tonight and all throughout the late night west coast trip, FSN is having a contest for you, the fan. Watch the broadcast and wait for the "keyword of the game" (not keyboard cat) and go here and enter for your chance to win!!! Its that easy, and with some pretty cool prizes its worth the wait and probable FSN Pittsburgh server crash. One winner each night will win two tickets to an upcoming home game. Plus, everyone is entered into the grand prize -- an autographed Max Talbot Stanley Cup Champions team picture, igloo seats for Anaheim vs. Penguins on November 16.